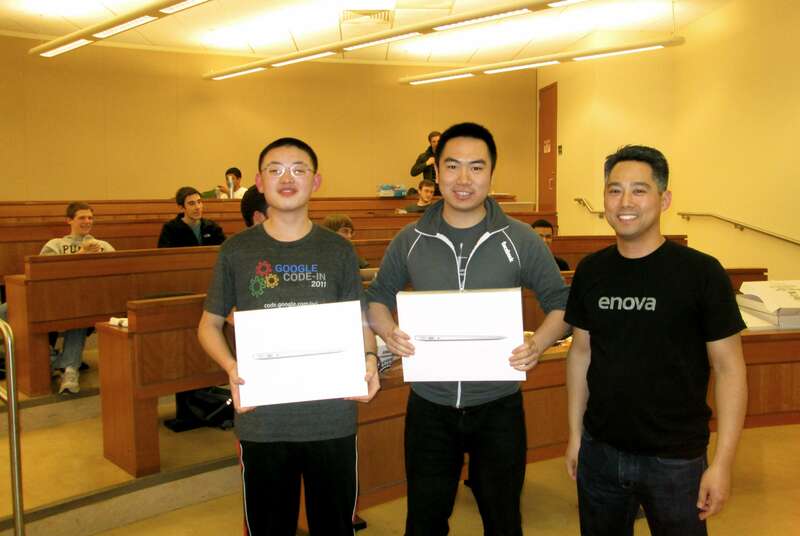 Enova On Campus at Purdue! - Enova International, Inc.
Enova On Campus at Purdue! I was amazed by the strong turnout at the Purdue No Limit Code ‘Em “Hackathon” event at the end of February! The students brought their A-Game coding skills to make this event extremely competitive. While the students were working hard at the competition, we made sure they were getting fuel and having fun by serving pizza, Red Bull, Insomnia Cookies (my new favorite! ), and handing out our Enova swag. We even played the Social Network soundtrack for motivation. I loved seeing the faces of the winners when we handed over the MacBook Airs, IPads, and gift cards. Even the last place contestant won a case of RedBull! All the students worked very hard and it was great to see everyone having a fun time doing what they love. To top it all off, Fred Lee received this note after the event – always great to hear our events are appreciated! “Hi Fred, I had a lot of fun last night! I doubt I will get to go to another event since this is my last semester, but I hope you continue the Enova “hackathons” – they are the most fun of any of the coding events / competitions I have gone to.” – Edward Raff, Senior at Purdue University. ❮ Enova Is Hosting A Networking Event!